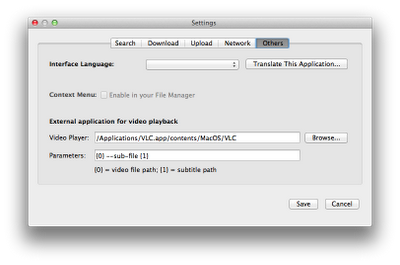 Subdownloader is a nice application to automatically download the subtitle of a movie. It parses your files and connects and uses OpenSubtitles to get the list of available subtitles for a particular movie, it can be configured to fetch your favorite language(s). With VLC player, this would be a perfect combination. To enable "play" button on Subdownloader to automatically launch VLC player, go to Preferences -> Others -> and then fill the fields as in the snapshot below.